Bandsaws are one of the least understood machines that carvers use. Having the right blade can make a huge difference in the ease of cutting out your blank. 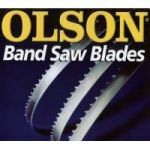 The Olson blades we sell are 3/16" deep, 4 teeth per inch (TPI), skip tooth. They are very sharp, smooth cutting (for a 4TPI blade), and long-lasting.